I suppose guys like me can be partially to blame. Over time I have been conditioned to answer these questions the same way over and over again. Instead of steering the conversation to what is ultimately most important (how are the boards going to make them money) we end up talking about features and benefits. Sure you want your menu boards to look good and jibe with the décor of your location, but more important than that is how the items are laid out. For those who are in the market for their first menu board system, or those looking to swap out and change their current menu board system, you’re in luck. Now you can and should bear the importance of well-designed menu boards in mind as you speak with menu board companies. For those who currently have a system and who have no intentions of changing, this is where the leap of faith comes in. If I told you that with a menu board enhancement you could see a sales lift of 5-10%, would that be worth it? This is what marketing agency King-Casey suggests is achievable. Look at your weekly/monthly sales and tack on that 5-10%. We are talking about some significant dollars and cents! High Design, Weak Strategy. When it comes to identifying a firm to help you with menu board enhancement, note that not all solution providers are created equal. Far too often companies are drawn to cost-attractive menu board redesigns provided by those who fabricate the boards. Or companies might engage the services of well-meaning design firms whose primary focus is on high design which does not necessarily generate increased sales and profits. Effective menu board design is driven by effective business analysis, strategy and sound execution. Going with a sign company for your menu boardsseems logical, and in many cases it is. However keep in mind that their expertise is usually limited to the manufacturing of signs. This is fine if you want to turn over a Word document or spreadsheet and have them apply some designs to your menu items, but what good is that going to do? What you’re left with is a menu board that has your signature and high profit items lost in the mix. This isn’t limited to just sign companies; there are menu board companies that do the same thing. The only difference is that they have a product line specific to the industry. The key is to work with the right menu board company that asks the right questions. There are also marketing firms that work specifically in quick-service and fast casual that can also be of assistance. When you are dealing with an expert it shouldn’t be assumed that you can turn over all of your information (i.e. items, colors, logo, etc.) and expect magic to happen. Nobody should know your business better than you. This is why a design debrief is so important. Important questions are asked. What are your signature items / most profitable items? How do customers use the menu boards? What problems are they having with the menu boards? How do people order at your restaurant? Taking the time to answer these questions diligently can lead you to the golden nugget that is an optimally designed and effective menu board strategy. After digesting the findings, it is now time for the design. You’ll know if you are working with the right company if your conventional thoughts are challenged. Conversely, if you don’t like something or if an item seems out of place, question it! The end product may not look at all what you were anticipating. However, it should be the responsibility of the company you are working with to open your eyes and mind to a different way of thinking. The time has come to install your signs. Keep in mind that for those with existing menu boards, this doesn’t mean a whole new system. We hope that your existing structures will work to support the new designs. In fact, we’ll work at all cost to make that happen. As for those looking for their first or a new system, it doesn’t mean you have to break the bank for the Cadillac. The same process is taken for a foam core display as there is for a multi-screen digital menu board installation. 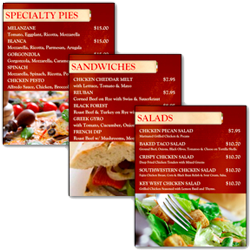 The features and benefits of menu boards are good to consider, but it is the layout and design that sells your food. The nicest looking designs are quite often not the most effective. Taking the time with an expert to impart your knowledge of your business will pay dividends. A menu board enhancement does not have to mean a whole new system, just new designs and new graphics. Want to hear more? Check out a menu board company that services the design end and the product end! Or give me a call today at 888-235-2579.